If you were worried that Queen Elizabeth II was going to freeze to death, destitute and penniless on the cold rainy Little Match Girl streets of London this year, you can relax — the UK government has just given her a raise. From now on, instead of making £HOLYSHIT per year, she'll be pulling in £OHMYGODAREYOUSERIOUS annually. So what's that equal when you convert it to US dollars? Elizabeth's previous salary was a paltry $44.8 million USD, but, thanks to a high level of income generated from Royal Family-owned properties, next year she'll earn $56 million. That's nothing compared to what the Motherland's monarch used to make; in 1991, the Queen pulled in $121.2 million. That means she makes more money than all but the world's top three earning athletes — a trio that does not include LeBron James, David Beckham, Peyton Manning, Rafael Nadal, or Alex Rodriguez. Royal income is based on how profitable the Royals' $7.6 billion in real estate holdings are annually. 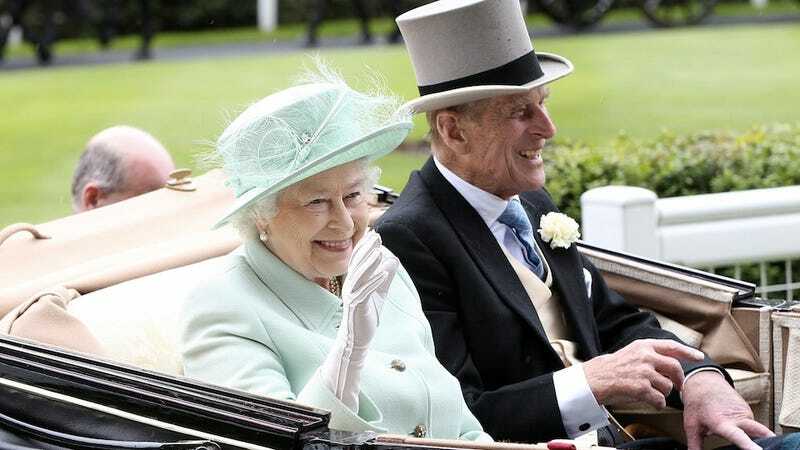 According to NBC, the Crown Estate funnels all of its profit to the Treasury, which then pays out 15% of the Estate's prior two years' earnings in salary to the Queen. The Queen, in turn, uses her income to buy fancy hats and pay her household staff and buy super high quality Lisa Frank royal stationary that features pink tutu-clad bunnies with enormous purple eyes dancing en pointe on a neon green map of the UK. But Elizabeth II isn't the only royal with a big payday on the horizon. Since today is Prince William's 30th birthday, a $15.5 million inheritance from his late mother's estate becomes his to use to buy Prince things, like jackets with brushes on the shoulders. At the bottom of the article about Queen Elizabeth's enormous paycheck, NBC's website helpfully suggests that I may also be interested in reading an article entitled "1.5 Million Children in Imminent Danger of Starvation in West Africa."